Chanteuse Country US née Julie Griffin, le 3 Janvier 1956 à Waxahachie (Texas). Julie Miller fut mariée à Buddy Miller durant 20 ans. Ils firent quelques duos ensemble bien qu’ayant chacun leur propre projet musical. 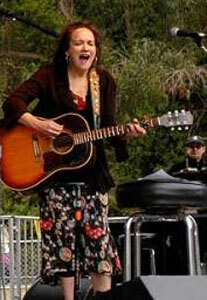 Texas-born singer/songwriter Julie Miller grew up in a music-loving household. As a teen in Austin, Miller made her professional debut as a singer and began collaborating with her future husband, guitarist/singer/songwriter Buddy Miller. They settled in Nashville, and shortly after Buddy released his solo debut Your Love & Other Lies on HighTone Records. The album featured singing and songwriting from Julie as well, and one of her songs, "All My Tears," was covered by Emmylou Harris and Jimmy Scott. Harris ended up working with both the Millers, offering Buddy a lead guitarist spot on her 1996 tour, and providing guest Vocalss on Julie's albums, 1997's Blue Pony and 1999's Broken Things. Julie and Buddy Miller also collaborated with likeminded musicians and friends like Victoria Williams, Mark Olson and Jim Lauderdale as the Creek Dippers, and with Steve Earle and Patty Griffin, who also contributed to Broken Things. In 2001 Buddy & Julie Miller released their eponymous debut album as a husband-and-wife duo, and a compilation of their HighTone recordings entitled Love Snuck Up was issued in 2004. The Buddy & Julie Miller album Written in Chalk arrived in 2009 on New West.